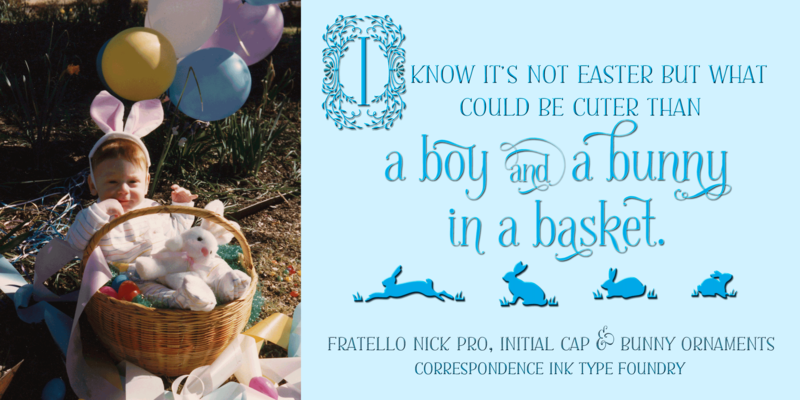 I’m so excited to share the news about my latest arrival…Fratello Nick ! 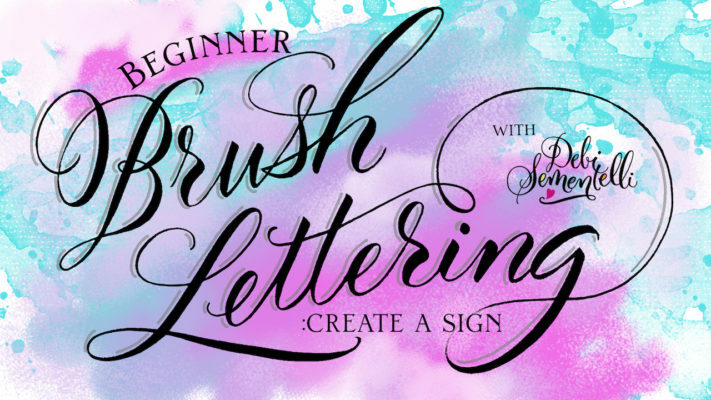 It’s already made it to #30 on the Hot New Fonts list after just one day! 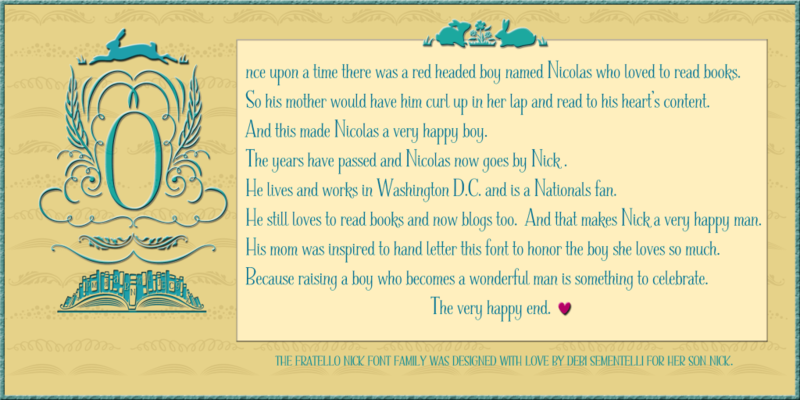 Inspired by my son Nick and his love of books, the font family has tons of cool stuff. This is one of my favorite pics of Nick. He was 5 years old. Who couldn’t love that face??!! 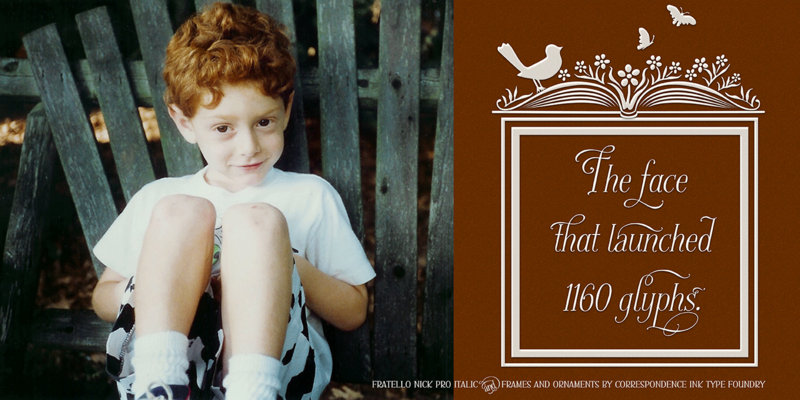 enclosed by one of the Fratello Nick frames. Can’t wait to get it? 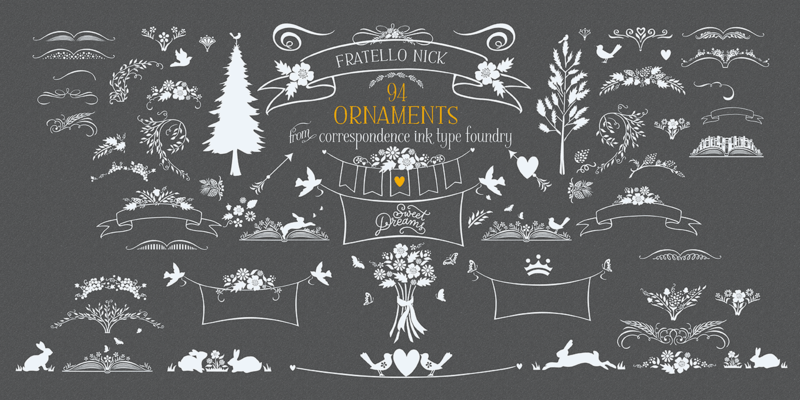 Here’s the link to Fratello Nick on Sale. 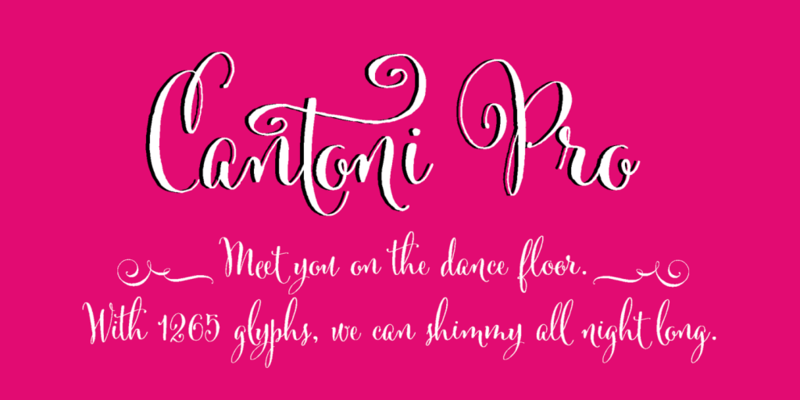 The INTRODUCTORY OFFER IS 50% OFF. 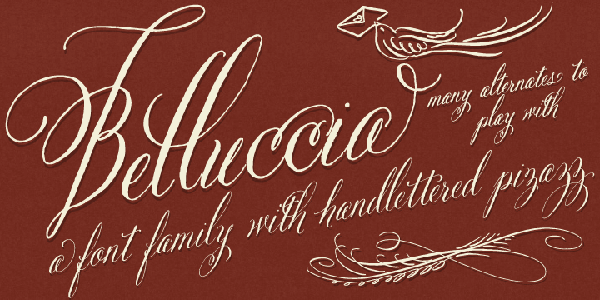 But my subscribers GET AN ADDITIONAL 10% OFF with the code: Nickfont. We used it for his birth announcement/our holiday card. 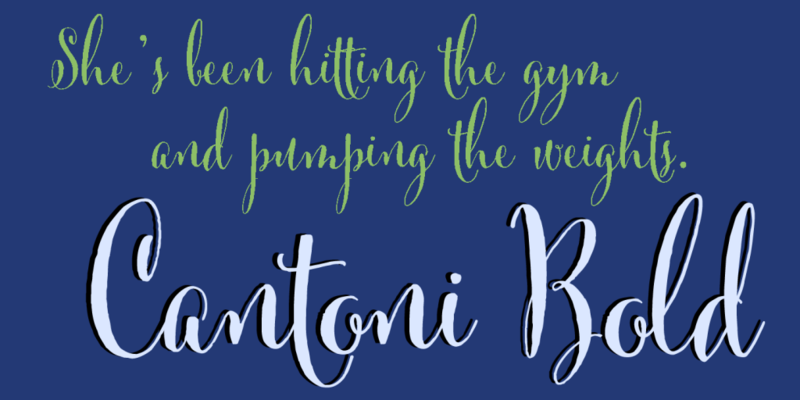 Regular, Bold, Italic and Bold Italic. Nick went to Georgetown and was a handler for their mascot, Jack the bulldog. 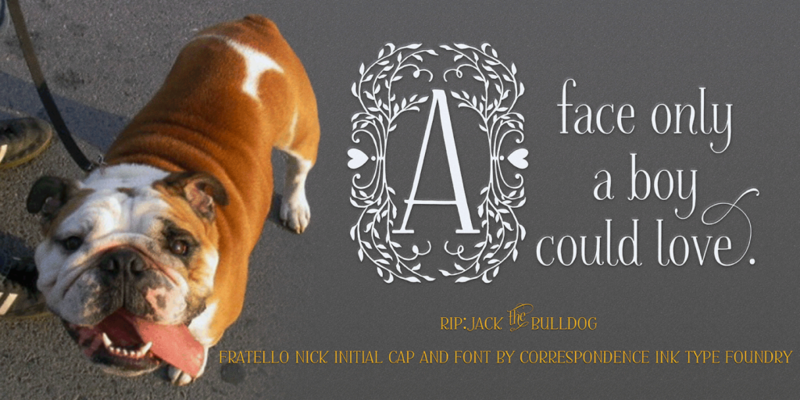 Jack passed away this June so I thought it would be nice to memorialize him in this graphic. Those are Nick’s shoes on the extreme left. The “A” is one of the letters in the Initial Cap font. like the hearts, to the inserts on the sides. I had so much fun creating all these ornaments! 94 in total. Of particular note are the trees with the birds at the top. Every morning I take a walk in my neighborhood. The trees always have lots of birds on them. But there’s always one tree that just has one bird at the top. I call him the King Bird:) So I included him sitting on two different types of trees as ornaments in the font. I couldn’t fit all 72 frames on one poster! But this includes a lot of my favorites. I love the ones with the books, birds and bunnies as well as the florals. They feel very story book like to me. 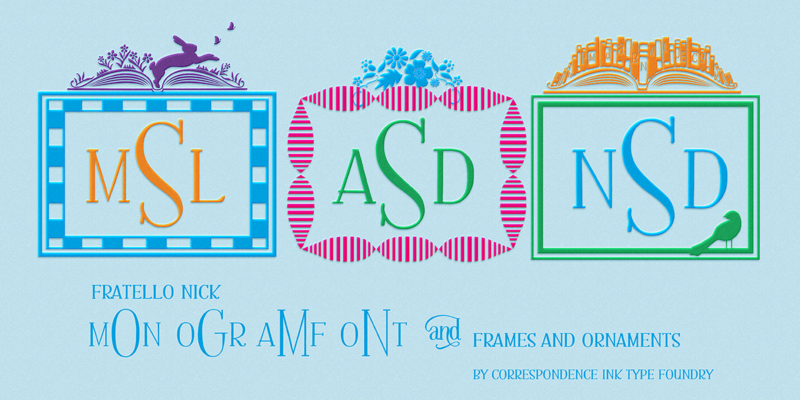 Here’s some of the frames combined with the Monogram font in action! And check out these Split Monograms! You can easily extend the lines on either side . They work great for return addresses. 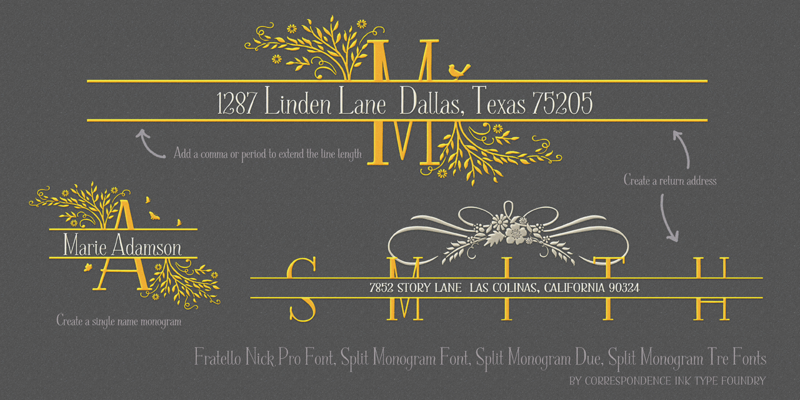 Or single monograms. 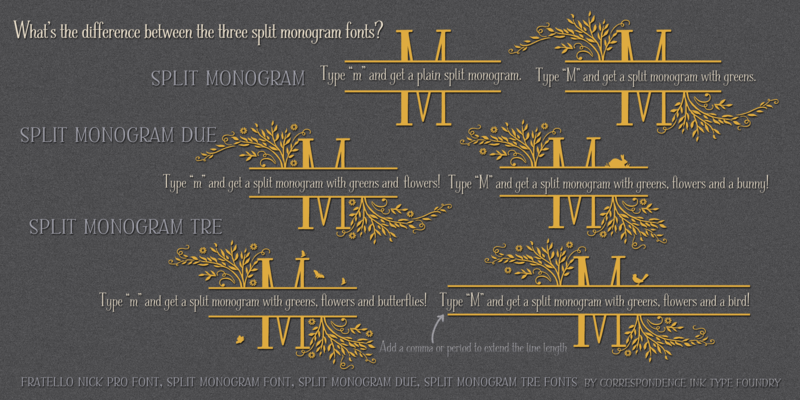 There are three sets of Split Monograms. You can see in the graphic above how they are different. They go from plain to fancy! 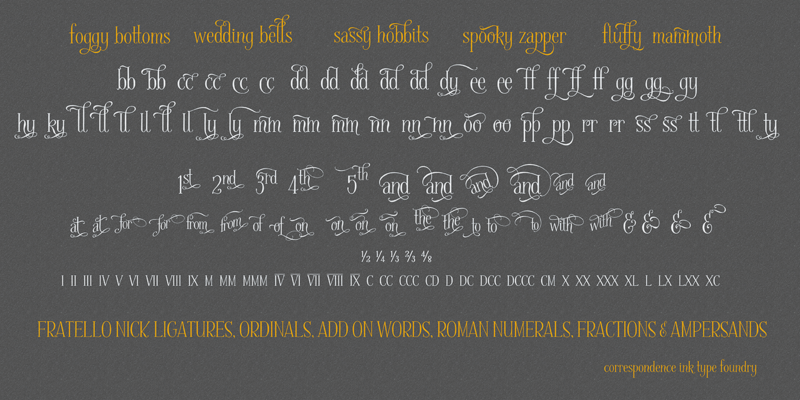 Here’s all the extras like ligatures, ordinals, add on words, fractions and roman numerals. 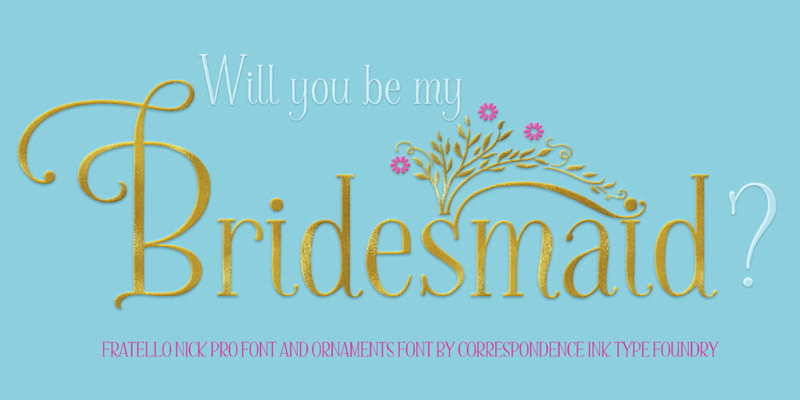 This font family is jam packed! 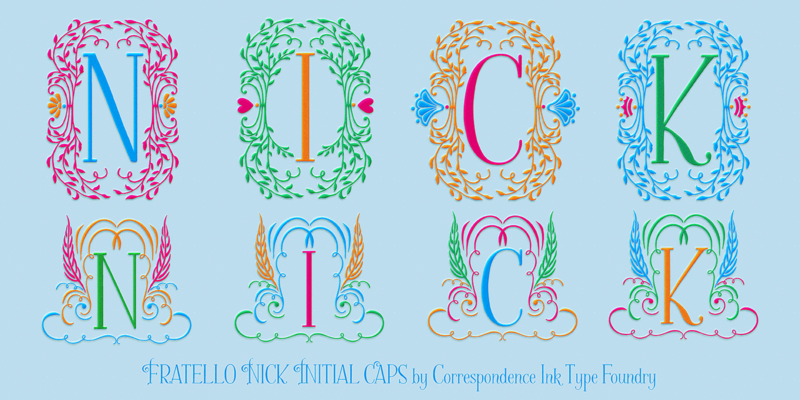 Have fun using either of two different styles of Initial Caps. Again, you can see in the top row that there are different ornaments added to each letter. I like the hearts and crowns the best. 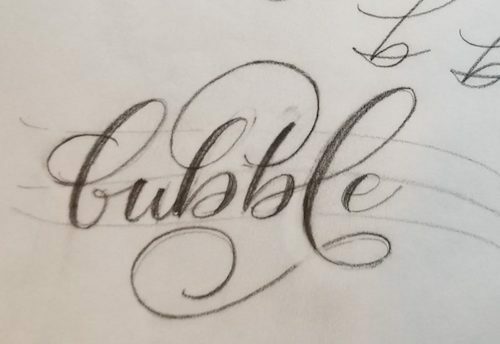 Here’s an example of some of the cool alternate letters. 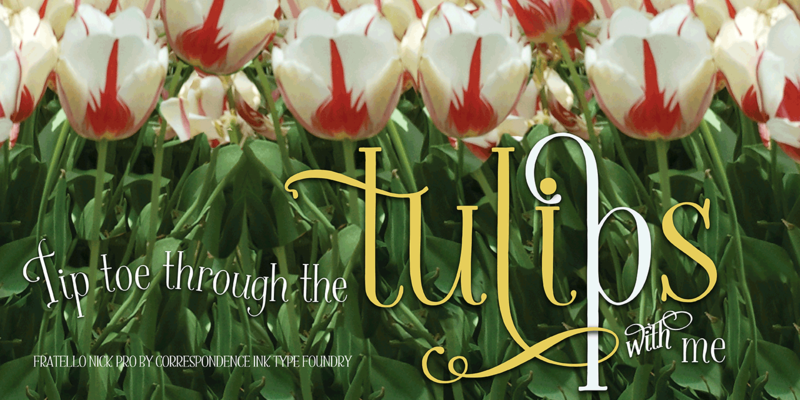 It was fun coming up with different combinations like in the word “tulips”. I also made special ornaments that can fit with some of the letters. The flowers and greens over the “s” is an example of one. 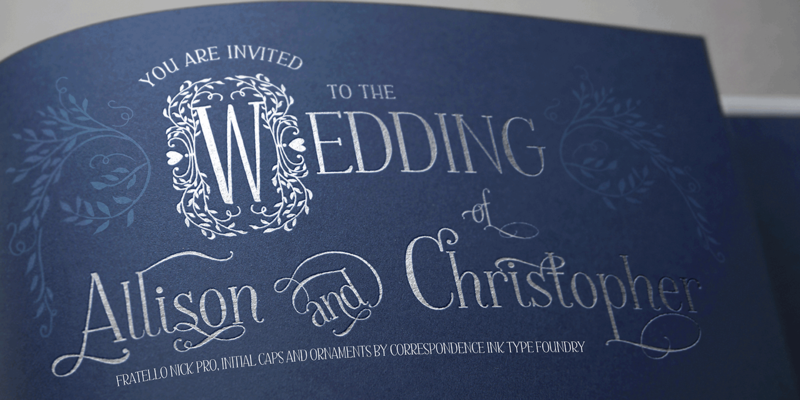 was used to create a sample wedding invite. And of course I had to share this cuter than cute pic of Nick in his Easter basket at 6 months! 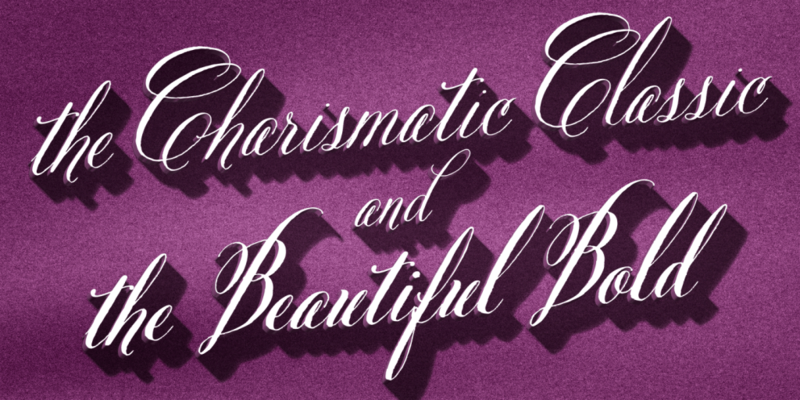 In the end here is the story of why I created this font. I’m so proud of the man my son Nick has become. 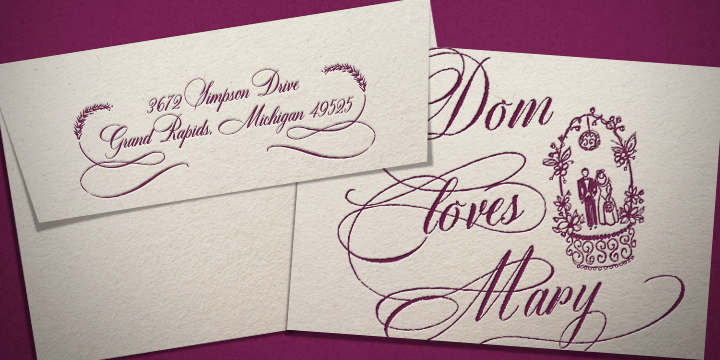 I hope this font expresses that. 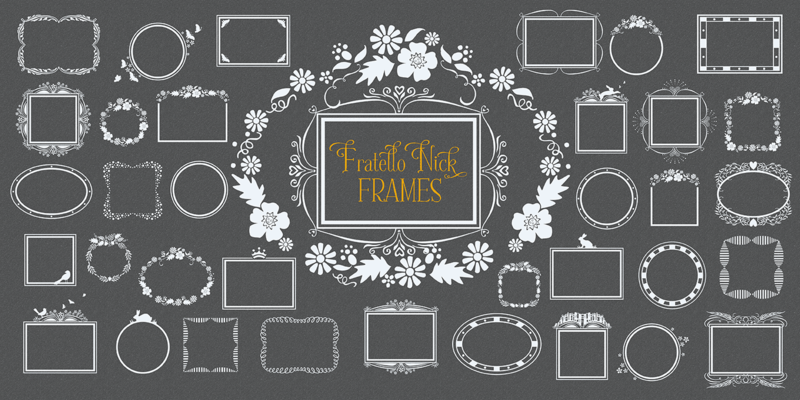 Here’s the link to Fratello Nick on sale. to GET AN ADDED 10% OFF the Intro Offer of 50%!